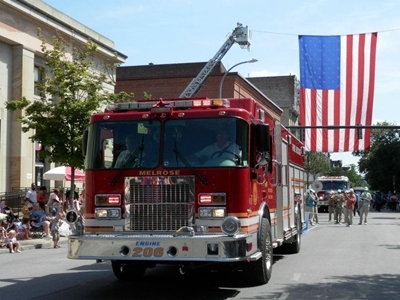 2013 marked the 100th Anniversary of the Melrose Fire Company. Organized on 4 January 1913, it originally composed of four Executive Body officers and an Active Body. When the Melrose Fire District was formed on 9 December 1921, the Executive Body became known as the Fire Commissioners of the Melrose Fire District, elected by the taxpayers, while the Active Body continued to be known as the Melrose Fire Company. With its twenty-three charter members, the Company met in its formative years in the blacksmith shop owned by H. P. Sterns. This building would later become the Melrose Garage. Notable among the charter members was William Diefendorf, a Melrose fireman for some 60 years until his death in 1973. Mr. Diefendorf was the Postmaster in Melrose for many years and the proprietor of a General Store. Over the years he served in almost every office of the Melrose Fire Company including that of Chief from 1936-1938. The first piece of equipment was purchased in 1921 at a cost of $250. It consisted of a sixty-gallon chemical tank mounted on a two wheeled cart; which was either drawn by hand or wheeled onto a truck via two long planks and driven to the fire. The first fire alarm consisted of a large iron locomotive wheel ring, suspended from a wooden frame and located at the junction of State Route 40 and Melrose-Valley Falls Road. A small maul was used to sound the alarm. This alarm was replaced by a siren located above the Melrose Garage, and later by sirens located at the present firehouse and at Hurley’s Garage. On 1 March 1932, the District voted to purchase new equipment, a plot of land and to erect a firehouse. Two propositions were submitted to the taxpayers, one for $2,500 and a second for $4,000. The former was passed and the Fire District legally bonded. The property was purchased for $350. The Fire House was erected at a cost of $711. The remaining $2,939 was used for the purchase of a truck and equipment. 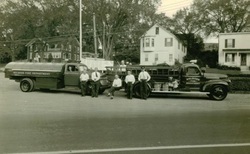 Leroy Nible (Chief from 1938-1946 and owner of the Melrose Garage) and several members of the Active Body volunteered to attach the old hand drawn cart to the new truck and set it up with the equipment. Melrose experienced its most devastating fire to date in November 1932. At approximately two o’clock on a Sunday morning, the Odd Fellows Hall on the south-east corner of State Route 40 and Church Street broke into flames. Due to a lack of water and proper equipment (which was in the process of being assembled) both the Odd Fellows Hall and the Grange Hall were totally destroyed. Following World War II, a Chevrolet pumper was purchased from war-surplus. This truck had no seats so Harry Hurley had to drive it to Melrose while sitting on milk create! The Army’s Cosmoline (a brown colored, wax-like coating) was scraped off and the truck was painted Red. In 1950, a new Ford flat-head 6 cylinder truck was purchased and a used oil tank was cleaned and installed on the back of it (it became our first Tanker). This truck (because it was so heavy and produced only 95 horsepower) had to leave the firehouse and head north regardless of where the call was. If the call was south, they turned around at the top of Campbell Hill to get a running start at the hill in Melrose. In 1953 the current firehouse was built. This building (now the meeting room and kitchen) had 3 overhead doors in the front. In 1959 a new International Howe Pumper was purchased. This was one of the first fire trucks anywhere with air brakes and served as our front line piece of equipment until 1989, some 30 years. In 1964, a GMC cab-over Howe Pumper-Tanker was purchased. The building’s first expansion was the addition of the south engine room in 1969. In 1975, new Federal Signal Thunderbolt Siren was installed behind the firehouse on the old windmill tower (that we had obtained from the end of Turner road. years before) by Frank Crandall & Sons. The 5hp Siren it replaced was erected at the top of Campbell Hill approximately one mile north of the station. In 1981 the District purchased an International Pierce Engine-Tanker. This truck was our first Diesel powered truck and our last truck with a manual transmission. In 1987 the second expansion to the building was made which included new bathrooms, a Chief’s office and a room to house the Breathing Compressor. In 1989 the District purchased our first custom cab fire truck, a Pierce Dash. This truck replaced the 1959 Howe as the front line piece. In 1999, the North Engine Room, Radio Room and the Locker Area were added to the building. 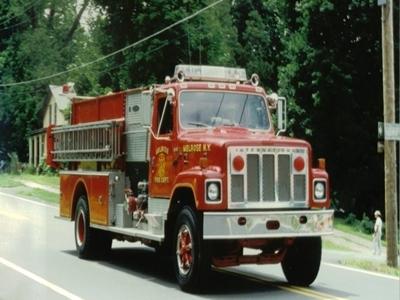 In response to an increased number of Traffic Accidents, Rescue calls, and Hazardous Materials calls, in 1999 the Fire District purchased our Heavy Rescue truck. In 2000, we started our Emergency Medical Service program to better serve our community. We currently have 13 active Emergency Medical Technicians on-duty and respond to over 100 Medical Emergencies every year. Currently we also have a 2000 Ford F-450 Brush Truck, and ATV with trailer, 2005 & 2007 Engine-Tankers made by 4-Guys Fire Equipment, a portable light tower, and a Rescue Boat with an outboard motor. In 2010, after several incidents on the Hoosic River, we began training for and now possess the capabilities of a Type II FEMA Rescue Team and currently serve as a Swift Water Team for the State of New York. In 2010, a Tactical Rescue Trailer was purchased and equipped with Swift Water rescue, Ice Water rescue, and Rope rescue equipment. We have been deployed around the state to such natural disasters as Hurricanes Irene and Lee in 2011 and again in 2012 to Hurricane Sandy on Long Island. 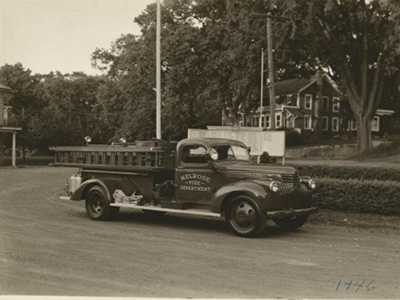 The growth and development of the Melrose Fire Company from its modest beginnings to the present modern fire-fighting organization has been the result of the efforts of many hard-working, conscientious and civic minded persons. To these people, the community of Melrose is forever grateful.